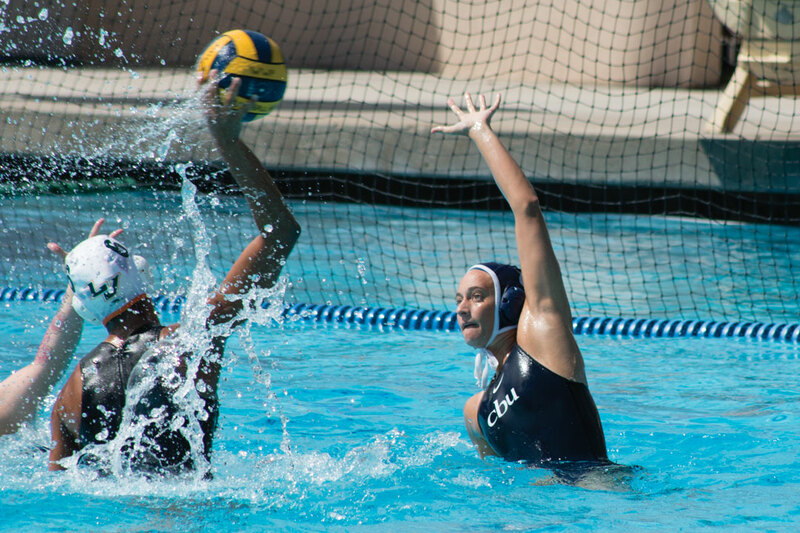 The women’s water polo team at California Baptist University is gearing up to face several Golden Coast Conference opponents, preparing for the GCC tournament April 28 – May 1. The team is currently 17-7 and undefeated at home. Last season, the team placed fourth in conference — the best finish in its three-year reign. Laura Kocsis, graduate student in sports management and utility player, said she feels the season is going well. After defeating conference opponent Concordia University, Irvine, 14-2, the team is looking to heighten its performances against top conference teams. This season, the winner of the conference will receive an automatic bid to the NCAA tournament May 13-15, a conference first. Several athletes have already picked up GCC honors and Altura Credit Union honors. Hannah Evans, senior kinesiology major and 2-meter player, grabbed the first GCC honor of the season by being named the GCC Player of the Week. Evans has also been named an Altura Credit Union Athlete of the Week, alongside Kocsis and Valerie Spezzaferri, junior criminal justice major and driver. Spezzaferri said conference season is one of the most exciting times of the year. Spezzaferri and Kocsis both agree that the team is strong and able to succeed well into conference play. “I am confident and trust that our team is capable of taking the gold medal at the tournament,” Kocsis said.